Michael S. Monthervil always knew he wanted to join the Army. He originally planned to enlist after college, but a few years into his studies, he could not wait any longer and enlisted in the Infantry. He was attached to the 10th Mountain Division and loved going out on missions and “taking out the bad guys.” All that changed on July 28, 2014. During a training exercise in Afghanistan, Specialist Monthervil fell on his neck, injuring his spinal cord and resulting in the loss of use of his legs. Michael remembers being injured and medically evacuated. He was operated on in Germany the same day he was injured and then sent immediately to Walter Reed, where he stayed for nine days. Finally he was transferred to the Tampa VA Medical Center for his rehabilitation. Michael’s brother, was also in the Army and stationed in Germany at the time. His brother was allowed to travel home with Michael and be by his side for the surgery. Michael’s injury has not stopped him from being active. In the short time since his injury he has poured himself into rehabilitation and regained movement in his arms and dexterity in his hands. He also joined the Tampa Generals Rugby Club, traveling up and down the east coast to compete with other teams. Michael credits Rugby with helping him to learn how to handle his body after his injury. 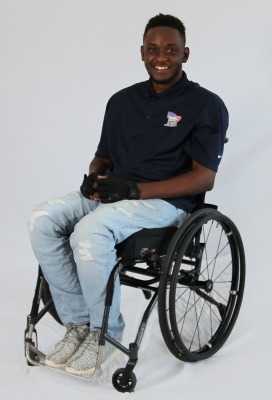 A specially adapted home from Homes For Our Troops will allow Michael to focus more on his recovery. His current home is not wheelchair accessible, making it difficult for him to complete everyday tasks and physical therapy impossible. Michael looks forward to having a place where he and his parents and siblings can safely live together. “It would mean everything to me to have a place where I can build a family and gain my independence back,” he says. He credits his family with helping him stay so positive and says his parents are everything to him. Michael also dreams of having his own family and going back to school, but his biggest goal is to walk again someday. Michael calls Homes For Our Troops and its supporters “a blessing.” He says there were moments when he wondered if his injury was it for him, but he always kept faith that God has a plan.